asmirnov: Stacilo. Vdaka za vsetky navstevy. [ENGLISH] The coordinates will bring you into the general area of the Vrsatec Klippe (you don’t really need the GPS for this one). Please find a place to park at the top and read about the geology of the area (from this printout). Enjoy the views and try to imagine the processes that led to the formation of this remarkable structure. Then walk around and try to answer the questions as best you can. The Pieniny Klippen Belt (PKB), part of the Western Carpathians (WC) geological region, is a narrow (max 15 km) tectonic zone spreading from Austria, through Slovakia, Poland, Ukraine to Romania. It forms a natural geologic boundary between the external WC (e.g., the Flysh zone) and the central WC (e.g., the crystalline massifs). Geologic evolution of the PKB started in the Jurassic Period in the calm seas of the southern margin of the European tectonic plate, however, the complex (klippen-like) make-up of the PHB is a result of geologically younger (predominantly Tertiary) tectonic movements. Simplistically, various sedimentary rocks (limestones, marls) forming at the bottom of the sea for millions of years were later tectonically disturbed, transported and folded into complicated geologic structures which can be found in various places in Slovakia (e.g., Maninska Tiesnava, Oravsky Podzamok, Pieniny, etc.). 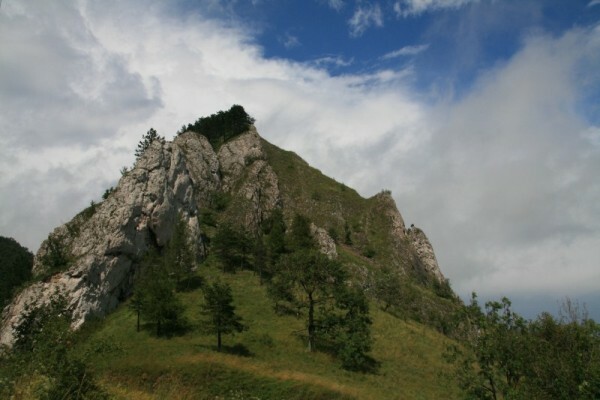 Most rocks of the PKB can be divided into two general units (successions) depending on the relative depth of sedimentation: shallow-water (The Czorsztyn Unit) and deep-water (The Kysuce-Pieniny Unit). The fact that rocks of these both lithologically distinctive units are often found in the proximity of each other documents the magnitude and extent of the above-mentioned tectonic activity. The Vrsatec Klippe represents the largest occurrence of the Czorstyn Unit in Slovakia. The morphologically distinct Klippe is comprised of limestone sequences of Jurassic to Early Cretaceous age with varying content of fossilized fauna and flora (e.g., ammonites). The enveloping rocks of the Klippe (marls, marly shales) were mostly weathered and eroded away as a result of external geological processes (e.g., water, wind). To log this cache it is necessary to attach a photo of yourself with your GPS with the Vrsatec Klippe in the background (if you are alone the picture of your GPS with the Klippe will suffice) and email me the answers in your own words to the several questions listed below. When inspecting the locality (it is sufficient to stay on paved roads) you must find the contact of the white Klippe limestone with the enveloping unit. How do you know that you have found it? If you have problems describing in writing, you can send me a picture to email address in my profile. What is the color of the rocks of this enveloping unit? In general, what chemical element causes this particular color in rocks? Why did the rocks of the enveloping unit weathered away so quickly and do not form Klippe structures like limestones? One does not need to be a geologist to successfully answer these questions, although one will need to employ simple logic in conjunction with internet and perhaps books from the library. There is at least one unequivocal answer to each question. Even though you may not be 100% sure about your answers, email me your best reasoning and I will be glad to give you another hint or a helping hand. Cheer up, the goal of Earthcaching is primarily to educate. Good luck. Congratulations to VeeN&Julcek for FTF! Please log "Find it" only after your answers were approved by cache owner. If you want, you can always log the cache as "White Note" and change it after approval to "Found It". [SLOVAK] Koordinaty Vas zavedu do oblasti Vrsateckych bradiel (GPS nebudete ani moc potrebovat). Zaparkujte na vrchu a precitajte si opis tejto Earthcache. Uzite si nadherne vyhlady a snazte sa predstavit geologicke procesy ktore viedli k vytvoreniu tychto bradiel. Potom sa poobhliadnite po okoli a snazte sa zodpovedat na otazky. Pieninske Bradlove Pasmo (PBP), sucast geologickeho celku Zapadnych Karpat (ZK), je uzka (max. 15 km) tektonicka zona tiahnuca sa v dlzke 600 kilometrov od Rakuska, cez Slovensko, Polsko, Ukrajinu az do Rumunska. Tvori prirodzenu geologicku hranicu medzi vonkajsimi ZK (napr. flysove pasmo) a centralnymi ZK (napr. jadrove pohoria). Geologicky vyvoj PBP zacal v Jure v kludnych morskych vodach na juznom okraji Europskej tektonickej platne, ale jeho vysledna (bradlovita), struktura je dosledkom geologicky mladsich (prevazne Tretohornych) tektonickych pohybov. Zjednodusene povedane, rozne sedimentarne horniny (vapence, slienovce) usadzujuce sa na dne mora miliony rokov boli neskor tektonicky narusene, premiestene a prevrasnene do komplikovanych geologickych struktur, ktorych pozostatky mozeme najst na viacerych lokalitach na Slovensku (Maninska Tiesnava, Oravsky Podzamok, Pieniny, atd.). Horniny PBP mozno zjednodusene zaclenit do dvoch odlisnych jednotiek (horninovych sledov) v zavislosti od relativneho sedimentacneho prostredia: plytkovodneho (tzv. Czorsztynska jednotka) a hlbokovodneho (tzv. Pieninsko-Kysucka jednotka). To, ze horniny oboch litologicky odlisnych jednotiek sa casto nachadzaju v tesnej blizkosti svedci o rozsahu a magnitude uz spominanej tektonickej cinnosti. Vrsatecke Bradla reprezentuju najväcsi vyskyt Czorstynskej jednotky na Slovensku. Samotne morfologicky prominentne bradla su tvorene sekvenciami vapencov Jurskeho az Spodno- Kriedoveho veku s obsahom roznej skamenelej morskej fauny a flory (napr. amonity). Ich obalove horniny (slienovce, slienite bridlice) boli zväcsej casti erodovane (zvetrane) a premiestnene za pomoci roznych externych geologickych cinitelov (napr. voda, vietor). Na uspesne zalogovanie tejto Earthcache je potrebne prilozit fotografiu hladaca s GPS s bradlami v pozadi (ak ste sami, fotka vaseho GPS s bradlami postaci) k logu na geocaching.com a emailom mi poslat odpovede vlastnymi slovami na niekolko nasledujucich otazok. Pri prehliadke lokality (staci aj z asfaltky) najdete tektonicky styk bradlovych vapencov bielej farby s ich obalovou jednotkou. Ako viete, ze ste nasli tektonicky styk dvoch jednotiek? Ak sa Vam nieco taketo zle opisuje, mozete mi poslat fotografiu na email v profile. Akej farby su horniny obalovej jednotky Vrsateckeho bradla? Aky chemicky prvok vo vseobecnosti sposobuje takuto farbu v horninach? Preco horniny obalovej jednotky rychlo zvetrali a netvoria bradla podobne ako vapence? Na zodpovedanie tychto otazok nie je potrebne byt geologom, ale je treba sa nad nimi zamysliet a aplikovat logicke myslenie v spojeni s internetom alebo kniznicou. Na vsetky otazky existuje minimalne jedna jednoznacna odpoved. Aj ked ste si nie 100% isty odpovedami, napiste mi Vase najlepsie zdovodnenie a vysvetlenie a ja Vas rad usmernim, pripadne poopravim. Hlavu hore, cielom Earthcachingu je v prvom rade vzdelavat. Vela zdaru. Prosim logujte "Find it" az po schvaleni logu ownerom. Dovtedy mozete zalogovat kesku ako 'Write Note" a po schvaleni zmenit na "Found It". Upozornenie. Pocinajuc 29 oktobrom 2008 neuznam ziadny log, ku ktoremu nebude prilozena fotografia hladaca spolu s jeho GPS pristrojom. Ak ste sami prilozte fotku GPS s viditelnymi suradnicami. Ziadne vynimky. Ak mate slabu pamat, vytlacte si tento listing aby ste to nezabudli a zoberte si extra baterky aby ste potom nebanovali, ze sa nemate cim odfotit. Gratulujem VeeN&Julcek k FTF!